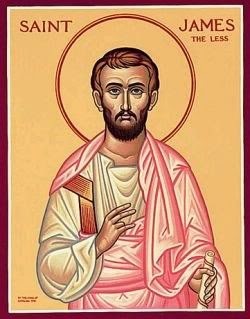 St. James, to distinguish him from the other apostle of the same name, the son of Zebedee, was called the Less; which appellation is supposed to have taken its rise, either from his having been called later to the apostleship than the former, or from the lowness of his stature, or from his youth. He is also known by the title of James the Just, a denomination all agree, with Hegesippus and St. Clement of Alexandria, to have been given on account of his eminent sanctity. He was the son of Alpheus and Mary, the sister of the Blessed Virgin and seems to have been born some years before our Lord. Jesus came with his brethren, and probably St. James among the rest, to settle in Capharnaum, at the beginning of his ministry. James and his brother Jude were called to the apostleship in the second year of Christ's preaching, soon after the Pasch, in the year 31. He was favored with an extraordinary apparition of his Master after his resurrection. Clement of Alexandria says, that Christ being risen from the dead, communicated the gift of science to SS. James the Just, John, and Peter, and that they imparted it to the other apostles. We are told by SS. Jerome and Epiphanius, that our Lord, at his ascension, recommended his church of Jerusalem to St. James; in consequence whereof the apostles, before their dispersion, constituted him bishop of that city. It was probably for a mark of his episcopal authority, and as an ensign of his dignity, that he wore on his head a lamina, or plate of gold, as is recounted by St. Epiphanius. Polycrates, quoted by Eusebius, testifies, that St. John did the same: others relate the like of St. Mark. It was probably done in imitation of the Jewish high-priest. St. James governed that church in perpetual dangers, from the fury of the people and their violent persecutions; but his singular virtue procured him the veneration of the Jews themselves. As to his sanctity, Eusebius and St. Jerome give from Hegesippus the following account concerning him: "He was always a virgin, and was a Nazarite, or one consecrated to God. In consequence of which he was never shaved, never cut his hair, never drank any wine or other strong liquor; moreover, he never used any bath, or oil to anoint his limbs, and never ate of any living creature except when of precept, as the paschal lamb: he never wore sandals, never used any other clothes than one single linen garment. He prostrated so much in prayer, that the skin of his knees and forehead was hardened like to camels' hoofs." St. Epiphanius says, that, in a great drought, on stretching out his arms to heaven, he, by his prayers, instantly obtained rain. His eminent sanctity made even the Jews style him the just man: and Origen observes, that Josephus himself gives him that epithet, though it is not to be found now in Josephus' works. The same reverence for his person procured him the privilege of entering at pleasure into the Sanctum or Holy place, namely, that part of the temple where none but the priests were allowed by the law to enter. St. Jerome adds, that the Jews strove, out of respect, who should touch the hem of his garment. In the year 51, he assisted at the council of the apostles, held at Jerusalem, about the observance of circumcision, and the other legal ceremonies of the law of Moses. Here, after having confirmed what St. Peter said, he devised the sentence which the apostles drew up on that occasion. This apostle being bishop of a church, which then chiefly consisted of Jewish converts, tolerated the use of the legal ceremonies, and, together with others, advised St. Paul to purify himself and offer sacrifice. He is the author of a canonical epistle which he wrote in Greek. It is at the head of those called <catholic>, or universal, because addressed not to any one particular church, but to the whole body of the converted Jews dispersed throughout the then known world. It was penned some time after those of St. Paul to the Galatians, in 55, and to the Romans in 58. It could not, therefore, be written before the year 59, fourteen years after the death of St. James the greater. The author's view in this epistle is to refute the false teachers, who, abusing certain expressions in St. Paul's writings, pretended that faith alone was sufficient to justification without good works: whereas, without these, he declares our faith is dead. He adds excellent precepts of a holy life, and exhorts the faithful not to neglect the sacrament of extreme unction in sickness. The oriental liturgy or mass, which bears the name of this apostle, is mentioned by Proclus, patriarch of Constantinople, and by the council in Trullo, and is of venerable antiquity. St. Basil, indeed, testifies, that the words of the sacred invocation in the consecration of the bread and of the cup, were not committed to writing, but learned and preserved by tradition down to the fourth century, which was done on a motive of respect and veneration: but other parts of the liturgy were written. Perhaps St. James gave only general directions about this liturgy, upon whose plan it was afterwards drawn up or enlarged. His singular learning in sacred matters is extolled by St. Clement of Alexandria, and St. Jerome.